In 2017, Banfield Pet Hospital and North American Veterinary Community (NAVC) partnered to release the first annual Veterinary Emerging Topics (VET)® Report. Our 2017 report focused on antimicrobial usage patterns among veterinarians treating common canine infections. For the 2018 report, we examined treatment of common feline bacterial infections, with a focus on the unique challenges of medication compliance in feline patients. Antimicrobial drugs are critical to the provision of veterinary care. However, antimicrobial resistance is a worldwide, growing threat to human and animal health. Because antimicrobial drugs are critical to the provision of both human and veterinary care, healthcare practitioners – including companion animal veterinarians – have a responsibility to ensure judicious and appropriate use of antimicrobial drugs. Consequences of not doing so include a loss of antimicrobial efficacy, enhanced development of multi-drug resistant bacterial strains, and poorer patient outcomes. The International Society for Companion Animal Infectious Disease (ISCAID) Antimicrobial Working Group has developed three sets of antimicrobial usage guidelines for common infections: urinary tract infections1, respiratory tract infections2, and superficial bacterial folliculitis3. These guidelines provide recommendations for treatment of dogs and cats, including drug choices, optimal dosage, frequency, and duration of administration. A 2015 AVMA survey4 found that only 12% of companion animal veterinarians were aware of these guidelines. With such low awareness, discordance between guidelines and actual prescription patterns would not be surprising. Developing an understanding of current prescription patterns highlights areas of opportunity for our profession in aiming for judicious and appropriate use of antimicrobial drugs. For our 2018 report, we reviewed thousands of medical records to understand how cats are being diagnosed and treated for respiratory and lower urinary tract infections. For respiratory infections, only 7% of cats were treated in accordance with ISCAID guidelines for upper respiratory tract infections and bacterial bronchitis. For cats with lower urinary tract disease, the majority of cats were treated with antimicrobials, with less than half treated with guideline recommended drugs. Of cases treated with antimicrobials, about one-third did not have a urinalysis or had negative urinalysis results. Among cases with positive urinalysis results, approximately 10% received culture and susceptibility testing. Of those, only one-third showed growth indicative of a urinary tract infection (FIGURE 1). There are two key takeaways from this data: first, treatment in practice often diverges from the ISCAID guidelines; and, second, antimicrobial use for lower urinary tract signs in cats is an area of opportunity as it relates to judicious practices. In order to better understand factors that influenced the observed treatment patterns, we conducted a survey of Banfield veterinarians actively engaged in clinical practice. This survey found that the cost of diagnostic testing was a barrier for some clients, and it can be challenging to effectively communicate the value and rationale for this testing. Additionally, perceived ease of client and patient compliance was found to be a primary consideration when selecting an antimicrobial for treatment of feline patients. First line antimicrobial choice was driven primarily by drug form and ease of administration. Educate the team! Make sure the entire team understands the importance of diagnostic testing. This ensures that clients hear a clear and consistent message about the recommendations for their pet no matter who they speak with in the hospital. Provide the why. Taking the time to educate clients about why a urinalysis and C&S testing is recommended can help compliance and ensures clients feel they are part of the decision making process. Ask, listen, and address. Make sure clients have a chance to air any concerns about the treatment plan and have questions and concerns addressed by the appropriate team member. Educate and demonstrate. Provide oral, written, and pictorial instructions and demonstrate medication administration while they are in the clinic with their cat. Encourage owners to precede and follow medication administration with positive reinforcement. Most readily understand this concept and can appreciate the opportunity to enhance the bond with their pet. Follow up. Schedule follow-up calls, emails or texts with clients to see how treatment is going and to offer support or advice if needed to successfully complete a course of treatment. Weese JS, Blondeau JM, Boothe D, et al. Antimicrobial use guidelines for treatment of urinary tract disease in dogs and cats: Antimicrobial Guidelines Working Group of the International Society for Companion Animal Infectious Diseases. Vet Med Int. 2011. Lappin M. Antimicrobial Use Guidelines for Treatment of Respiratory Tract Disease in Dogs and Cats: Antimicrobial Guidelines Working Group of the International Society for Companion Animal Infectious Diseases. J Vet Intern Med. 2016. Hillier A, Lloyd D, Weese J, et al. Guidelines for the diagnosis and antimicrobial therapy of canine superficial bacterial folliculitis (Antimicrobial Guidelines Working Group of the International Society for Companion Animal Infectious Diseases). Vet Dermatol. 2014;25:163. 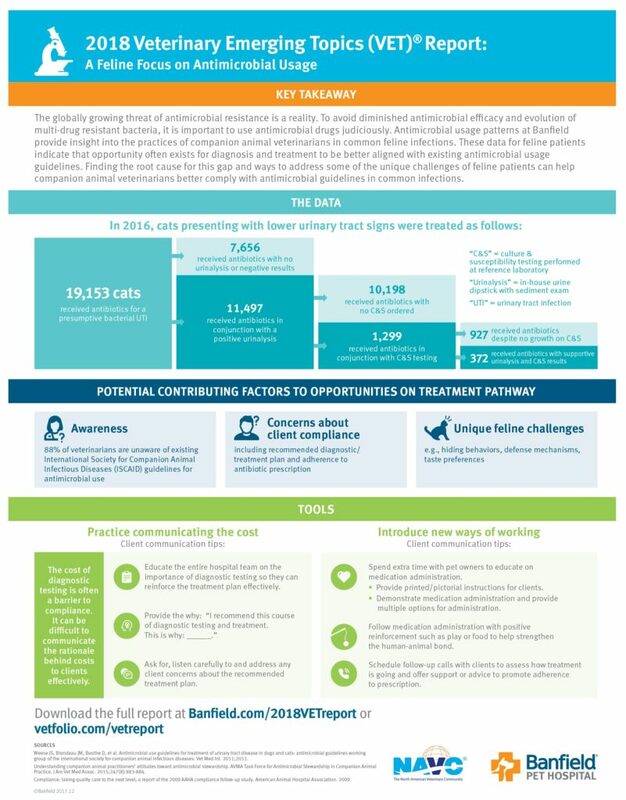 AVMA task force for antimicrobial stewardship in companion animal practice. Understanding companion animal practitioners’ attitudes toward antimicrobial stewardship. J Am Vet Med Assoc. 2015;247:883. Dr. McAllister is responsible for leading knowledge generation and research to support medical decision-making and to help advance knowledge within the veterinary profession. She earned her veterinary medicine degree from Oregon State University College of Veterinary Medicine and a master’s in public health from University of Minnesota.